Skateboarding program takes off at the Greenlaw Community Center as Skatelife Memphis builds and donates a half-pipe. 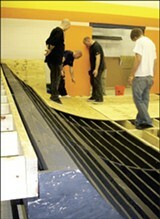 Volunteers work on the half-pipe at the Greenlaw Community Center. The basketball courts in the Medical District's Morris Park are always packed and on each backboard is a logo for a Coke product. That's how Thurman Richardson sees the future of Memphis skateboarding, as the modern equivalent of putting a basketball court in every park. "Twenty-five years ago, everyone wanted to get their name next to a basketball court," the Memphis native says. "It's a natural progression." Last week, with the sounds of basketball in the background — the squeak of sneakers, the quick bounce of the ball — Richardson and other members of Skatelife Memphis met at the Greenlaw Community Center to build a half-pipe. Skatelife Memphis raised $2,500 for the ramp by winning a grant from Nike's Back Your Block competition. The grant paid for most of the materials, and volunteers provided the labor. Richardson works as an IT systems analyst with Nike and has been skating since he was a kid. He's built a few launch ramps before, but says, "I bring more tools than experience." With local skateboard enthusiasts still waiting for the city's first skatepark — a $440,000 project that currently lacks a set location — Skatelife Memphis partnered with Memphis Athletic Ministries, or MAM. MAM uses sports to mentor urban youth. After the city considered closing the Greenlaw Community Center in 2008, along with Hamilton, Magnolia, and Bethel Labelle, MAM stepped in last year to lease the centers from the city. "We're not a sports organization, but we use sports as a hook to get kids involved in our activities," says James Armfield, MAM president. "They'll come for basketball practice." After practice, kids get mentoring, academic enrichment, and education in financial literacy. The group is also trying to get 20 computers for each of its 12 sites. In Greenlaw, MAM has started a mentoring program based around skateboarding. About 60 kids already are enrolled — a third of them girls — and about 12 show up every day after school. "Right now, there's a slope outside that they go down," says Mark Jannetta, the MAM staffer in charge of the program. "I hope they get more out of the ramp." Jannetta started a skate ministry with children in Tampa, Florida, and worked with the American Ramp Company in Joplin, Missouri, before coming to Memphis. "This ramp is three feet tall and 20 feet wide," Jannetta says. "The average ramp is about four feet tall, but most of the kids here are beginners. It's wider than normal, but it will still be fun if you're really good." Bellevue Baptist is sponsoring a block party and skateboarding demo Saturday, February 27th, at 2 p.m. at the center. Currently, the half-pipe is inside the community center but, if approved by the city, will be moved outside. "The only reason more kids don't do it is they don't have access to it," Richardson says. "This is going to give kids in this area access to it. "It's no different from having a basketball goal at your house or coming up here to play three-on-three and honing your craft. There's only so much you can do in your driveway." Until recently, the city was planning on building its first public skatepark in Glenview until opposition surfaced from Memphis City Council member Wanda Halbert, who thought the historic neighborhood was not the right place for the skatepark. The city is currently looking at Rodney Baber Park in North Memphis, because it is underutilized and the community recently asked park services to redesign and reimagine the space. The city is also exploring other locations but plans to host a community meeting about Rodney Baber for the Frayser and Raleigh communities sometime in early March. At Skatelife Memphis, they're already looking ahead. With its success with the Nike grant — the organization was one of the top 25 vote-getters in the nation — Skatelife now is pursuing funding through the Pepsi Refresh Project. "It underscores the groundswell of support there is for this," Richardson says of the Nike grant. "It's definitely been the turning point for this project." The Pepsi grant works similarly. Each month, Pepsi accepts 1,000 ideas. People vote online, and the winners are awarded grants of $5,000, $25,000, $50,000, and $250,000. In all, Pepsi plans to give away more than a million dollars each month. If Skatelife Memphis can win a Pepsi grant, they already have a partner in Binghamton ready with land for a skatepark. I've been impressed by Skatelife Memphis' perseverance. Even amid setbacks and delays with both the Riverfront Development Corpation's and the city's plans for skateparks, the organization has looked for innovative ways to achieve its goal of creating places where kids can skate. Based on historical evidence — a golf course in every council district — I think that once the first skatepark is a success, every district is going to be clamoring for one. "It's something that's missing in the city," Jannetta says. But maybe not for long.